It is very important to recognize the little signs that animals give you in stressful situations at the veterinarians. With these, you will be able to fully understand your pet in anxious and stressful times and be able to comfort them correctly. It is very common for animals to be diagnosed with anxiety, and there are many different types of treatments to help control and manage your pet’s anxiety. Here are some tips and tricks on how to help an anxious animal in times of need. Certain types of scents tend to calm cats and dogs down. Scents such as lavender or a specific pheromone can help benefit your animal in stressful times and help relax. Things such as fabrics that the owner has used or that smell like home can benefit the animal in stressful times and remind them of a safe place. In stressful times cats tend to like to be covered by a blanket or something that can keep them in a darker area. It that makes them feel safe, whereas a dog would prefer calm, quiet areas with very little to no stimulation. Keeping stimulants away can help calm down your dog and keep his focus on staying calm. Many find classical and calming music to be very beneficial for cats and dogs. Anything that has a “low frequency” tends to do better with stressed-out animals and can help calm them down in uncomfortable/anxiety-ridden situations. It is also suggested that when a cat or dog is very anxious to approach them in a low calming voice to help prevent their stress to increase. Many find it to be helpful to give animals treats during stressful times, but it tends to make their stomach more upset. It is suggested that if you have a nervous pet, feed them long after they have returned to their environment and show signs of calm behaviour. Some techniques are also to bring a stressed induced dog hungry to the veterinarians so that they are more prompt to take treats from the staff as well. In stressful times, many animals like to stay close to their owners. With this, it is suggested that in times that cause them more stress, we want to focus on their ears and head to distract them from what is going on around them. Some examples of this would be when cutting nails we suggest that you play with their ears and pet their head frequently to draw away from the attention to the toenails. 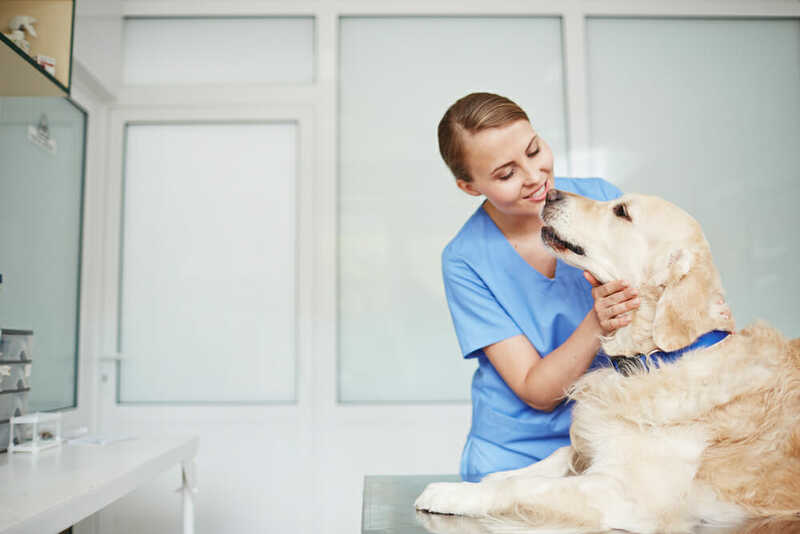 Hopefully, with these tips, it will help your animal to have a more calming, enjoyable experience at the veterinarians. It's Flea and Tick-Me-Off Season! "Why should I vaccinate my indoor cat? Small animal (cat & dog) on call is available for current clients until 10:00 pm. Following that time, please refer to our after hours contact.